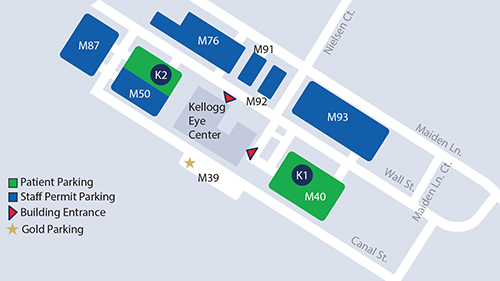 The Kellogg Eye Center in Ann Arbor has two patient parking lots, both adjacent to the building. Parking lot M40 on the south side of the Kellogg Eye Center and offers space for drop-off and pick-up. If you park in this lot, please use the south entrance. Additional patient parking is available in the front rows of parking lot M50 on the north side of the building. If you park in this lot, please use the east entrance, which is located directly off of Wall Street. Specifically marked handicapped parking spaces are located in both patient parking lots. All patient parking at the Ann Arbor location is free of charge in the areas designated specifically for patients. Complimentary valet service is available at the south entrance to the Kellogg Eye Center for patients and their families. Patient parking lots M40 and M50 are designated in blue. Parking at each of the Kellogg Eye Center community clinic locations is free of charge and located next to the building. Handicap parking is available.